Paneer Manchurian is a delicious vegetarian Indo-Chinese recipe that’s very easy to make and perfect to pair with my Easiest Ever Veggie Rice. It’s even great served as an appetizer! So I’m a little Manchurian obsessed these days. I’ve already shared two delicious Manchurian recipes here on the blog: Chicken Manchurian and Gobi Manchurian. I thought it’s time now to share another favourite Manchurian recipe of mine, Paneer Manchurian! 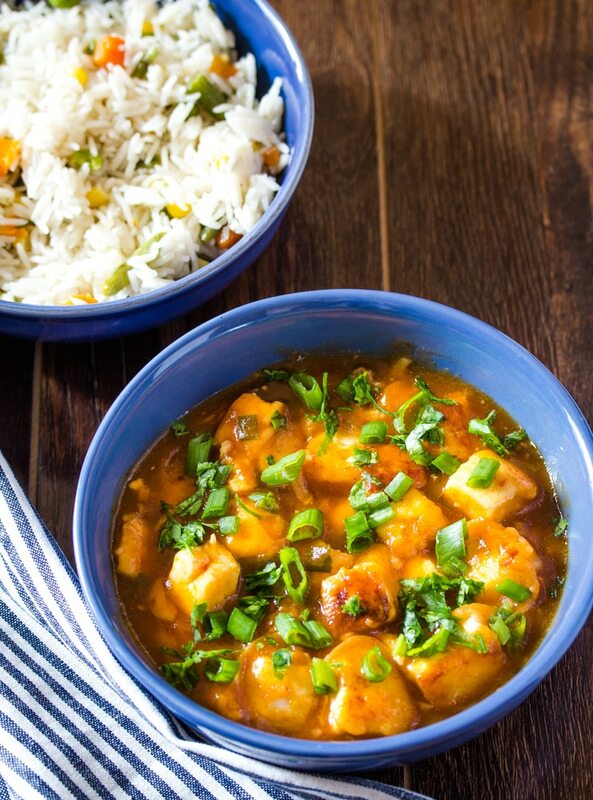 But first, let’s talk about how yummy paneer is and how it’s a great vegetarian option. What is Paneer you ask? It’s cottage cheese, which is a cheese made from the curds of skimmed milk. It’s super healthy too btw! Anyway, let’s be honest here, Manchurian is all about the sauce and basically we just need vessels to carry the sauce into our mouths, be it crispy chicken, or golden fried cauliflower or delicious fried paneer cubes!! There’s something super addictive about Manchurian sauce…it’s a little sweet, a little tangy and a little spicy. My kind of sauce, I tell you. 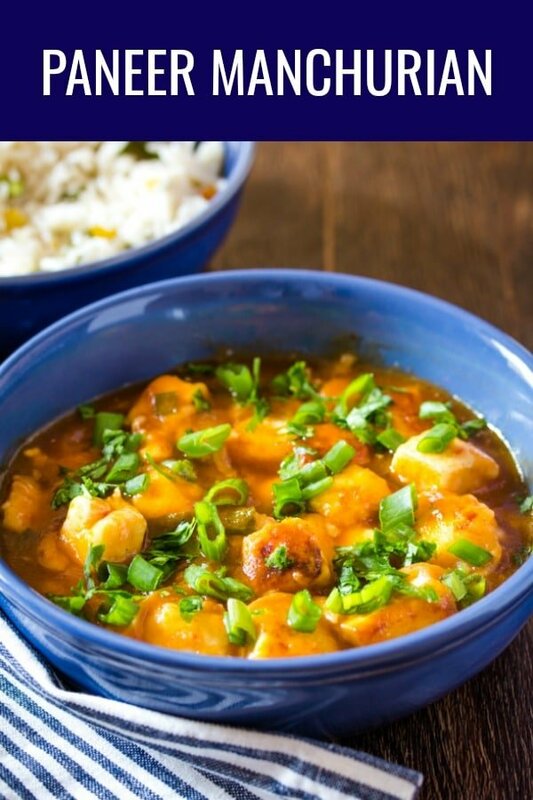 Add fried paneer cubes to this delicious sauce, and you’ve got a delicious recipe which is ready in literally 30 minutes. Now that truly is my kind of recipe…fast and delicious! So What is Manchurian Sauce? Manchurian sauce is a delicious sweet and tangy sauce made with ketchup, soy sauce, chilli garlic sauce and green onions. Some people add green capsicum to Manchurian sauce but authentic Manchurian sauce doesn’t have capsicum in it. I make it without capsicum too. 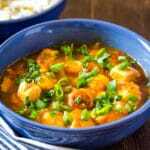 Manchurian sauce can be paired with protein or vegetables such as chicken or cauliflower. 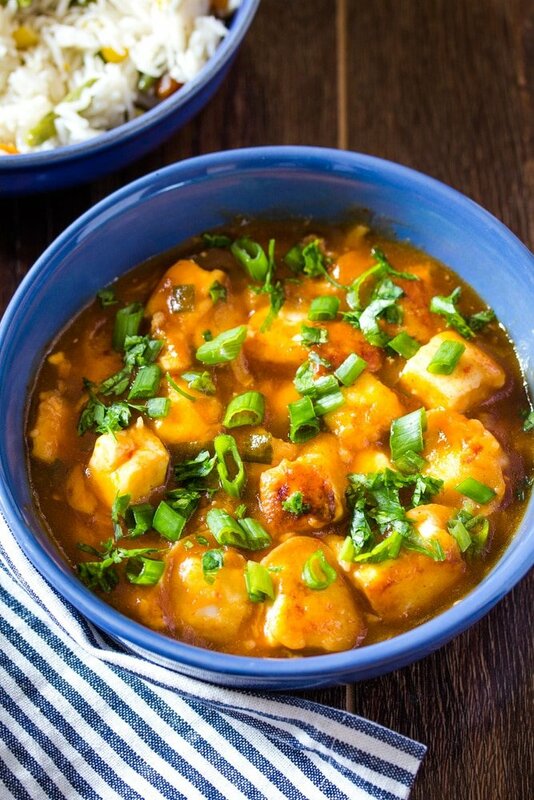 Its used to coat fried pieces of protein or vegetables or in this case paneer cubes. 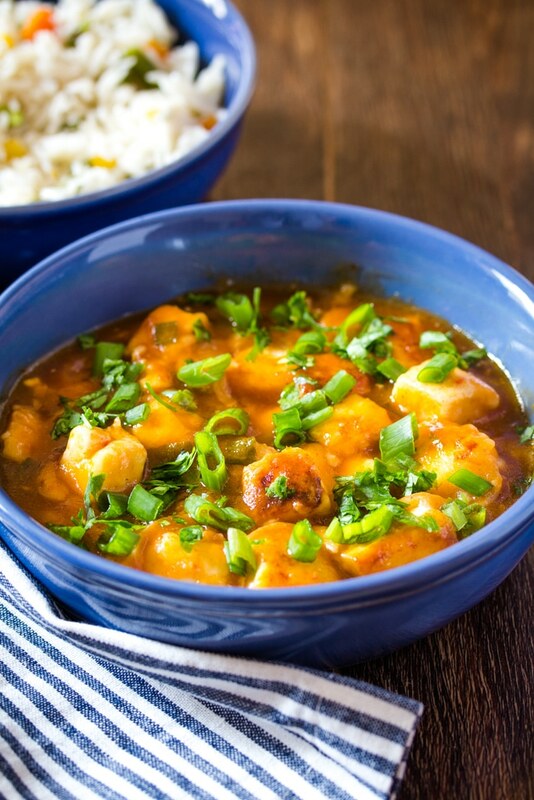 How Do You Make Paneer Manchurian? If you’re familiar with my Chicken Manchurian or Gobi Manchurian recipes, you’ll know that we start by frying chicken pieces or gobi florets coated in a cornflour batter. We do the same here for the paneer cubes, dip them in batter and fry them until they’re crispy golden brown. Then I make the manchurian sauce, and toss the fried paneer cubes in the sauce. And that’s it!! (For full recipe, scroll down to the recipe card please). I do hope you try this delicious Paneer Manchurian recipe with literally the Easiest Ever Veggie Rice! Paneer Manchurian is a delicious vegetarian Indo-Chinese recipe that’s very easy to make and perfect to pair with my Easiest Veggie Rice Ever. It’s even great as an appetizer! Make a batter for dipping the paneer by combining the flour, salt, red chilli powder, and water. The batter should be runny, but not too thick or thin. 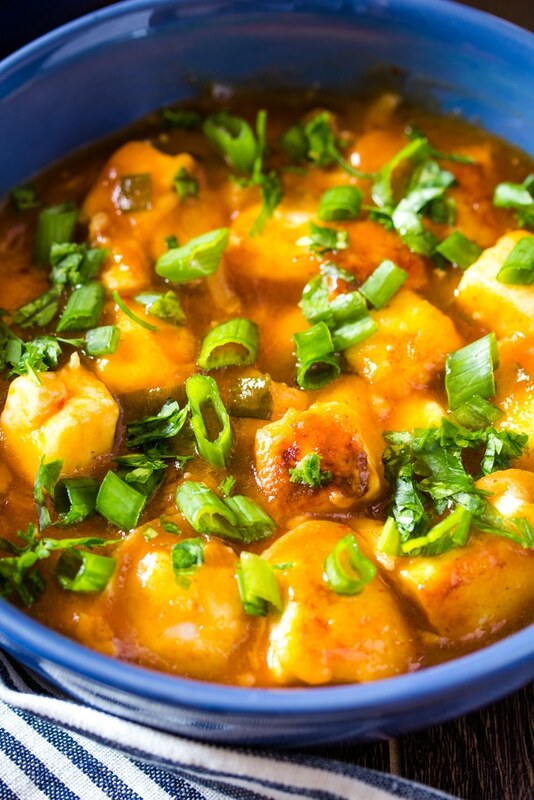 Dip the paneer cubes into the batter, and fry on medium heat until golden brown on all sides. Frying the paneer will take about 2-3 minutes on each side. Transfer the fried paneer on kitchen paper to drain the excess oil. Set aside. 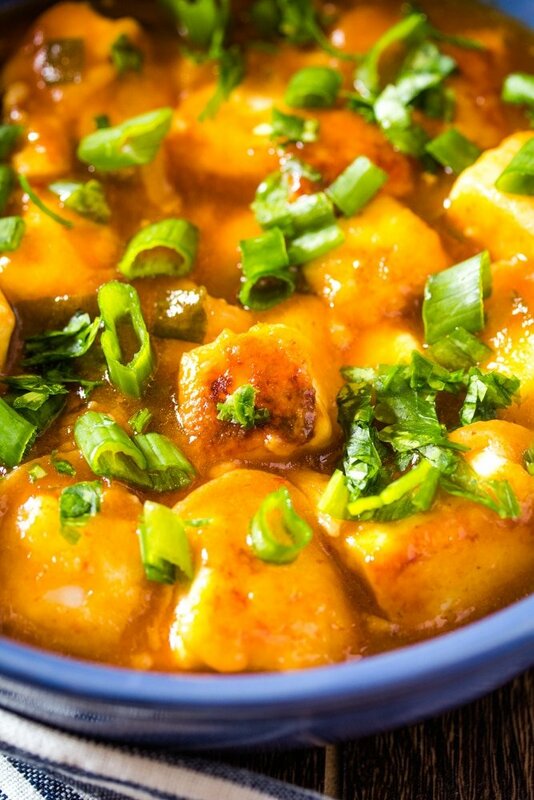 Toss in the fried paneer and mix so that the Manchurian sauce coats the fried paneer evenly. Serve immediately with garlic fried rice.